Forty-six-year-old Maurice Ouendeno stares silently at the arm of his blue plastic lawn chair. He waits a few minutes before beginning his story. His father, Tamba Lamine Ouendeno, died from Ebola on 26 March 2014 at the age of 73. He was one of the earliest confirmed victims: his death came just a day after the Guinean government declared the outbreak in four southeastern districts. A retired doctor, Lamine had accompanied a former colleague and good friend who was “quite ill” to the hospital in mid-March. Later that same night, when his friend died, he helped dress the body. A few days later, Lamine began suffering from similar symptoms. "We did the only thing we could: pray for his soul"
Ouendeno says health workers from Médecins Sans Frontières told them not to enter the hospital room, as Ebola could be spread even after death. Years of working in the mines had taught Ouendeno not to question safety protocol. He convinced his mother and siblings to obey to the doctors. It was the Red Cross that came and took his father’s body away. The family never got to give him a proper burial. They never even got the chance to say goodbye. 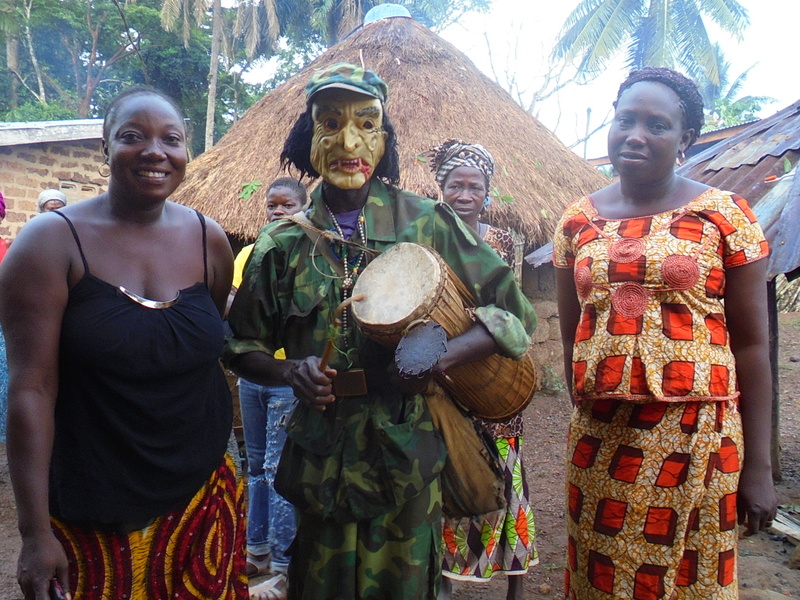 Death in Guinea is dictated by a number of traditional and customary practices. Protocol differs between the different religions, regions and ethnicities, and depending on the age and gender of the person who died. But it almost always involves the washing and dressing of the body by family or close friends, and the touching of the corpse by everyone who attends the wake. For Ouendeno’s family, which is Christian, there would usually follow a 40-day mourning period between the day the body is buried and when the spirit is sent on to the next world. During this time, the widow of a man who has died, wears all black until the day of the funeral. Then, family and friends come together to perform a special ceremony over a few-day period. People come dressed in their most colourful outfits. They dance and eat and drink to celebrate the life of the lost loved one. Sacrifices are often made. The soul is sent off. But because of government restrictions on public gatherings due to the fear of catching Ebola, families could not perform the normal burial rituals, nor could they hold the customary ceremonies six weeks after the death. "First you endure the pain of losing someone to this Ebola disease. Then they tell you that you cannot bury them"
For most Guineans, this was unimaginable and tragic. The ultimate proverbial knife in an already deep wound. Many families, particularly at the start of the outbreak, began hiding bodies or defying the orders of health workers. The virus continued to spread. Those that respected the health mandates suffered anguish, fearing their loved ones were stuck in limbo between this world and the next. With no choice but to obey the orders, the Ouendenos, Tenguinanos and thousands of other families have waited and waited. Ouendeno says his mother wore black for more than a year until the family was finally able to hold the send-off ceremony in mid-April 2015. Tenguinano says she continues to mourn silently, counting the days until they can hold a funeral. Earlier this month, in place of a corpse, the Ouendeno family chose an iron object to represent Lamine’s body. They carried the “body” from his native village to the cemetery in Gueckedou, where it was placed on a special tomb. 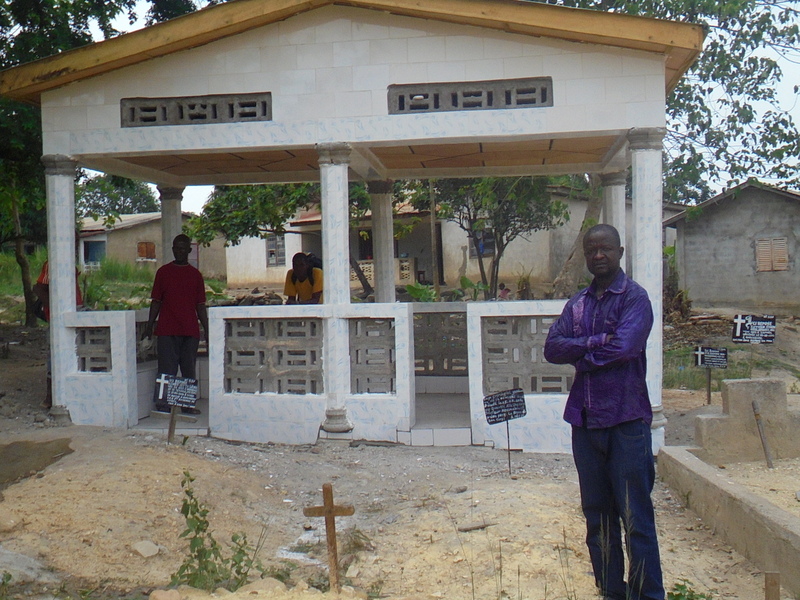 Other families, who also had no bodies, say they used special objects to guard the spirits of Ebola victims in special sanctuaries at the cemetery until they could be freed. To ask for forgiveness for the delayed funeral and to ensure their father’s soul was set free, as well as to bless and protect surviving family and friends, Ouendeno says he sacrificed five cows for his father, including an all-white animal, representing purity. The family cooked more than 250 kilograms of rice and had gallons upon gallons of traditional white wine. They invited people from near and far. Close friends came dressed up as Lamine, wearing lab coats and stethoscopes, pretending to imitate him, as if he was still present among them. At the end of the four days, two halves of a kola nut were placed on Lamine’s oldest brother’s head. The family waited anxiously to see if the pieces, which were flipped backwards onto the ground, would land upright, indicating that Lamine’s spirit was satisfied, or downward, indicating he was not happy. The pieces both landed face up.